Our sweet angel of a son is now four years old. To say that I am handling this beautifully would be a lie. There are moments when I am very relaxed about how quickly he is growing and changing. There are some other moments when I am fast-forwarding in my mind to when he will leave our home to forge his own path. Most of time, I am constantly reminiscing about when he was smaller, about when he learned some new skill or discovered something new, about when he became more independent. Every day, he is becoming his own person. Our grown-up little boy, captured by David while playing after work one day. This shows his personality so much. Becoming a mother - Hudson's mother - has changed me in ways I could have never anticipated. I am extremely guarded person, someone who has trouble sharing their vulnerable core. I have been this way for most of my life, only showing my tender side to those who have earned that trust. From the moment that I knew he existed, I felt my hard shell soften. My love and admiration for my son is completely unguarded. I show that to whomever will listen, I shower him with affection and attention, I live for his happiness and well-being. 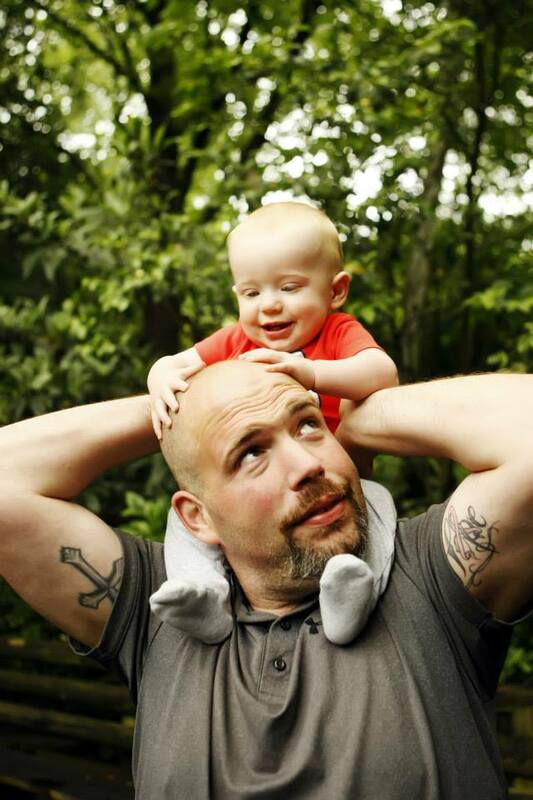 Unlike most parts of myself, the emotion and truth of my feelings about Hudson are unfiltered and unwavering. And it comes easily. It surprises me constantly. Walk with me down memory lane and humor this embarrassingly sentimental mother for a moment. I could attempt to share the thousands of pictures we have taken of Hudson, but I selected just a few (I promise). Looking back on his first year of life gives me perspective on my journey as a mother and human being. Each year with Hudson is important, and each results in growth. But nothing broke me out of my comfort zone more than the first year. The first real picture David took of Hudson. This was in our hospital room after we got settled for the evening. Things were quiet, Hudson had just eaten, and I was just staring at him (like most mothers do). The sweetest bundle as soon as he arrived. My heart grew three sizes that day. Visiting Daddy at the studio while I was still on maternity leave. He was so alert, even though he was only about a month old here. I miss these days. He was new every day, taught me more every day. It was a primal, intimate, quiet, challenging, rewarding time. One of the things that I love most about Hudson is his face. I know that sounds dumb. But he has the most wonderful, pensive expressions. Here, he was happily playing and then, all of a sudden, he looked toward the window in the living room. He looked over at it as if he was just figuring out all of the pieces. He still gets this face when he is working on something. Hudson's first Halloween. We arrived at his daycare to see their costume parade, and Hudson was holding court (as he tends to do). David and I decided not to dress him in a costume, so he has on a little monster onesie and a skeleton hat. Clearly a new parenting decision moment. I love that even so early, he had swagger. Hudson's first Christmas tree. He was so mesmerized by the lights, the same way I am every Christmas. I remember feeling as though we were making memories, though I am sure he will not remember this. Still so special to me. I had hopes that I would hit all of the marks as a parent with his first Christmas. Long story short, it was another example of how I needed to let go of my expectations and simply be in the moment. 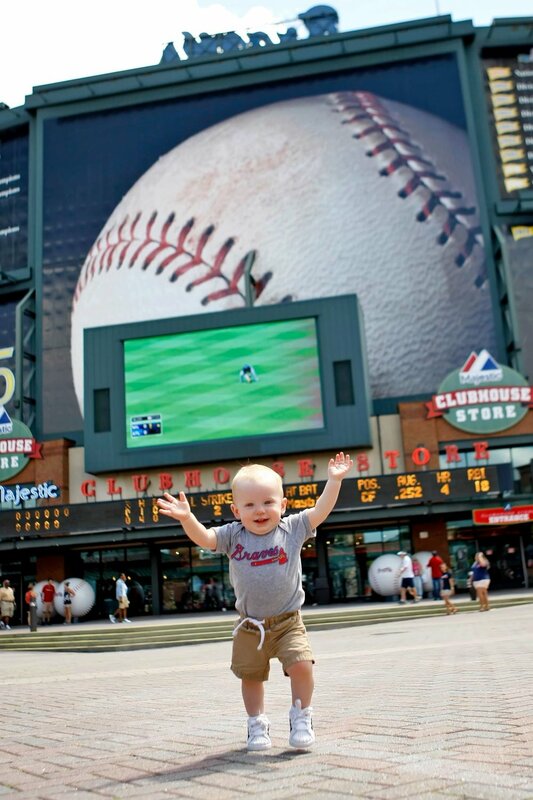 Hudson's first Braves game. And look at this face. Hudson had - and still has - so much joy. Hudson really soaked in the atmosphere as we wandered through most of the public areas of Turner Field. I love watching David and Hudson spend time together, but seeing the two of them share this experience made this a day that I will always cherish. Some advice from Hudson, in his fourth year: Sounds effects are important and need to be used. One more hug and kiss, always. Chocolate milk is king. Say no when you mean it. Tell people they are the best and they will prove you right.